Trump Performs MyPillow Promo At Rally [VIDEO] - Joe.My.God. If you have ever suffered a bout of insomnia, chances are you’ve seen some bizarre infomercials. You may therefore be familiar with MyPillow and have found yourself wondering if the product is the answer to your sleep issues. The company, MyPillow, has at least one huge fan. 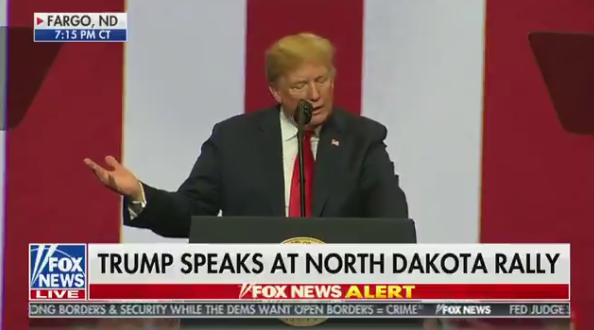 At a rally in Fargo, N.D., on Wednesday, President Trump noted MyPillow CEO Mike Lindell as a longtime supporter and marveled at how many ads the company airs. Granted, after many companies pulled their ads on Fox, it’s not surprising that a business like MyPillow would grab their slots for “peanuts,” as Trump estimates. In November Lindell agreed to pay a penalty of $1 million after a group of California County Attorneys took legal action against the company, alleging deceptive advertising. A consumer watchdog organization said MyPillow’s website made unsubstantiated claims its products can cure snoring, migraines, fibromyalgia, and other health maladies. Lindell agreed to the settlement, but insisted he made no medical claims whatsoever, saying MyPillow simply posted customer comments on the website. He told NBC News he is settling the charges simply because it makes financial sense, and is not an admission of guilt. The Better Business Bureau (BBB) has revoked the accreditation of Minnesota-based MyPillow, lowering its rating to an F based on a pattern of complaints by consumers. The BBB made the decision after reviewing MyPillow’s ongoing “buy one get one free” offer, which violates the organization’s code of advertising. Trump talking about MyPillow commercials. You know why? Because Hannity and Ingraham have lost so so so many advertisers that MyPillow ads practically run on a loop during those programs.